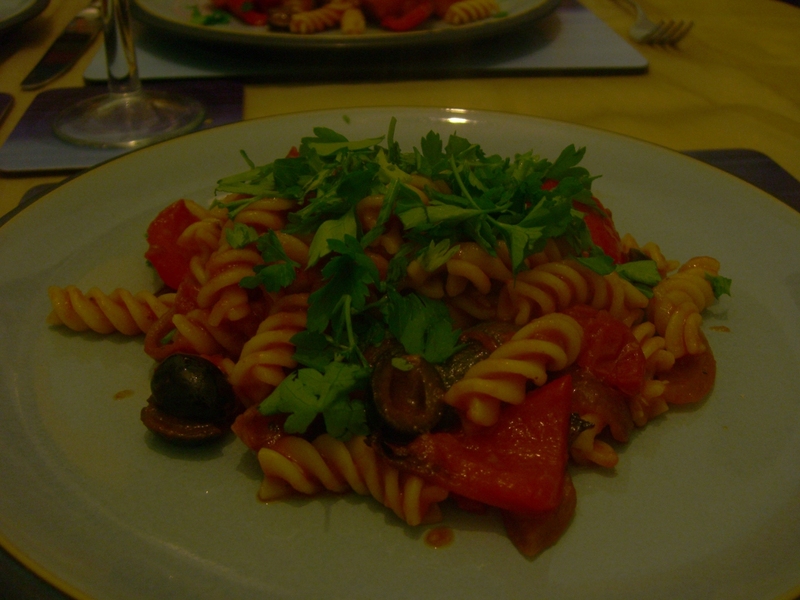 The second course for our three course meal was “macaroni with roasted vegetables”. I’m enough of a cook to know that you can replace macaroni with pasta, and not so greedy to want lots of pasta. Hence my rearranged title, which I confess to having some reservations about when we started. Far too often I’m offered pasta as a main in restaurants and it turns out to be exactly that, some pasta. 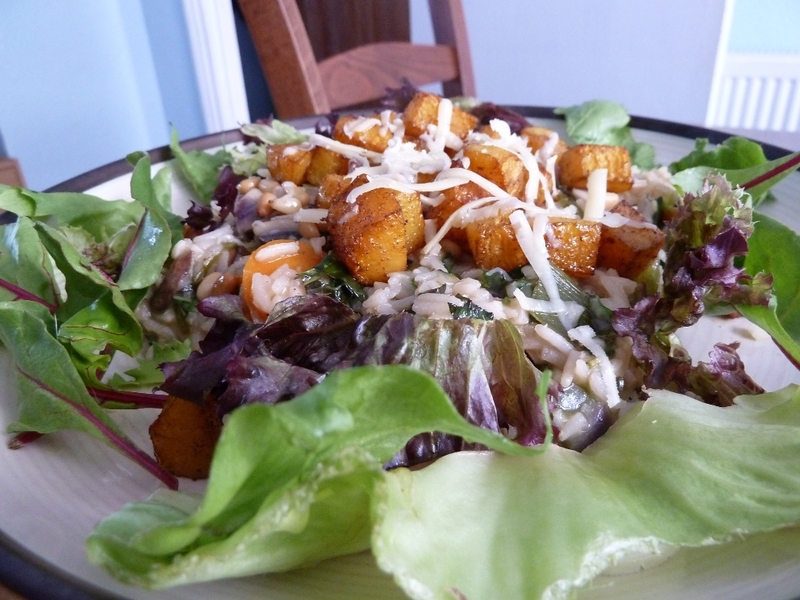 I’m pleased to say that this recipe did not disappoint. Another small parsley forest felled for our enjoyment. Roast some vegetables in garlic and olive oil at a high temperature for about an hour. Throw the lot together with some passata and black olives, heat through and serve. This is incredibly simple but does bring the best out of the natural flavours in the vegetables, and provides a well rounded meal. I normally find that passata needs a lot of cooking to give an intense flavour, but here we roasted some tomatoes so they did the trick nicely, in fact complementing the vegetable flavours without overwhelming it. The pasta provides a simple base, and I’d probably be happier with roasted potatoes, but this is one of the best ways to eat pasta and I will be repeating the experience! Recipe: “The daily cook book” by Love Food, September 5th. 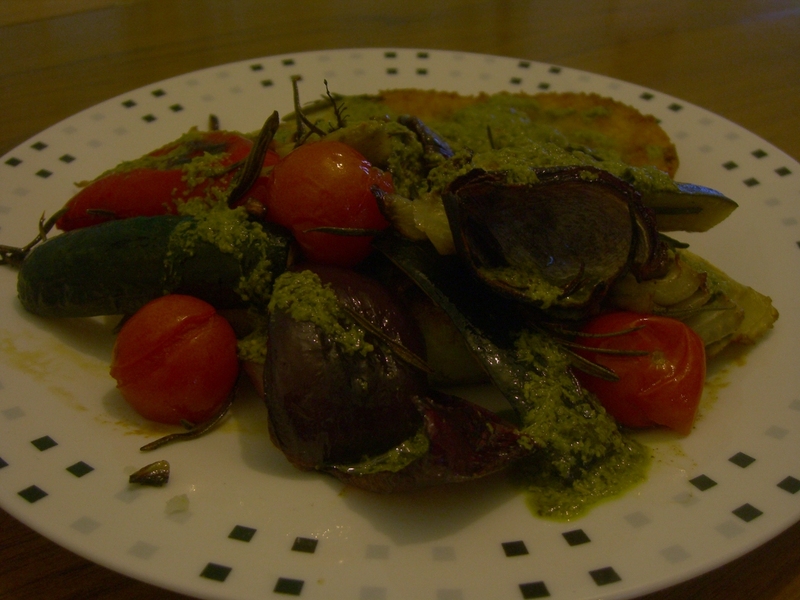 This is a misnomer – it should have been called roasted vegetables with rosti. The rosti are under there somewhere, I promise! This is a great way of cooking vegetables to bring out their natural flavours and add just a little more. The veggies are marinated for at least an hour in olive oil mixed with balsamic vinegar, garlic and honey – a fantastic sweetening and encouraging of the natural flavours, with the vinegar adding an amazing taste (I was recently converted!) The vegetables should be ones you like, because they taste distinctively of themselves, although roasted courgette is not as watery as normal, and decent tomatoes taste amazing like this! The rosti are potato cakes. This recipe is just to grate par boiled potato, fold them into patties and fry them. Its ok, but basically tastes of mashed potato – there are much better rosti recipes in the world. Cheese and onion work well, as does garlic. This recipe uses a pesto/olive oil mixture as a sauce that I liked, although I’m not really sure that it works better than a gravy would. Of course, being essentially a tasty way to cook roast, any other roasted items could be added. Sausages would seem appropriate as would good ol’ roasties and yorkshire puddings. In summary, this is a great way to roast vegetables and we’ll be experimenting along these lines again. Recipe: “the daily cook book” by Love Food, May 3rd.